This pirAtti (AzhwAr in feminine mood), seeing pairs of cranes having union in the garden, being a girl, she approached a female crane and requests it to express her sufferings to emperumAn. parAnkusa nAyaki requests the female crane which is enjoying with the male crane in the pond in the garden to go as a messenger to garudadhvajan (srIman nArAyaNan who has garuda flag). In this first pAsuram, parAnkusa nAyaki tells the female crane which is enjoying with her male crane to inform her state to emperumAn. First pAsuram. parAnkusa nAyaki looks at a female crane which stays nearby and knowing well “the male crane should be approached through the female crane” [arumpadham – Just like bhagavan is approached through srI mahAlakshmi who does purushakAram, AchArya too should be approached through other srIvaishNavas – here crane is considered as the AchArya who establishes the link between AzhwAr and bhagavan]- parAnkusa nAyaki requests the male crane through the female crane to inform her state to emperumAn. en cheyyum – what is wrong with that? O – is it even possible? Oh nArAy (female crane) who has beautiful feathers that will help fulfill my desire and who is tender/shy after the union with your partner (male crane)! You and your beautiful partner who have shining wings after your union, feeling for my separation and crying out “alas! alas!”, blessing me, go as a messenger sent by me to emperumAn who has raised garuda flag to protect others. While going there, if imprisons you and if you agreed to be imprisoned, there is nothing wrong with that (you will be seen as a great person for doing that). Being imprisoned for others is considered as a noble attribute. “puL uyarththAr” is also explained as the one who is carried by garuda. dhUthu – message – the ability of the AchArya (gataka) to express the desire of jIvAthmA to bhagavan. Glorifying the wings/feathers is due to them representing gyAnam (knowledge) and prEmam (devotion). The combination of female and male crane indicates the mutual respect/servitude of gatakas (AchAryas) amongst themselves. am chiRaiya – Just like a toddler will focus on the breast of the mother (which is the source of nutrition), AzhwAr focusses on the wings which are the means to reach emperumAn. The beauty glows due to mutual bliss out of the union of the cranes. Just like sishya will focus on AchArya’s gyAnam and serve him, parAnkusa nAyaki focusses on the wings of the crane. mada – humble; being ready to serve; due to the union, feeling lethargic and thus ready to obey the orders; nAN (shyness), madam (humility) and achcham (fear) are considered as very basic characteristics of women. parAnkusa nAyaki calls out for the help of the female crane who will understand what she is going through in separation from emperumAn. nArAy – like calling ammA (mother), ammE!, she is calling nArai as nArAy! aLiyaththAy – bless me, help me. Your presence is so glorious – just coming here to help me. nIyum – As seen in srI rAmAyaNam ayOdhyA kANdam 31.12 “sa brAthus charaNau gAdam nipIdya raghunandhana: sIthAmuvAcha” (iLaiyaperumAL/lakshmaNa held on tightly the lotus feet of his brother srI rAma, speaking at sIthA pirAtti first) – While srI rAma decided to go to the forest, lakshmaNa prayed to him to go along with him as well – at that time he approached srI rAma through sIthA pirAtt. So, parAnkusa nAyaki too first calls out for the female crane. 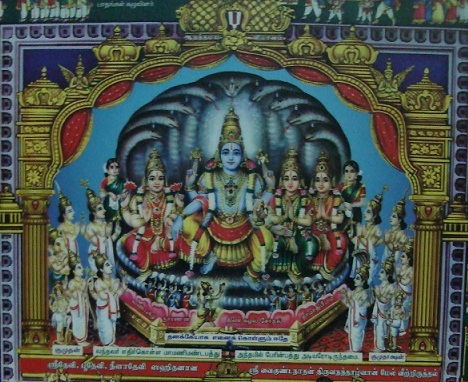 nin am chiRaiya chEvalumAy – Like “sriya:pathi“, our indulgence towards bhagavan is due to his connection with srI mahAlakshmi. You both are made for each other. enakku – Like the rishis complained to srI rAma showing their wounded body parts in srI rAmAyaNam ayOdhyA kANdam 6.16 “Ehi pasya sarIrANi” (You come and see our wounded bodies), parAnkusa nAyaki shows her body which is severely affected by the separation from emperumAn. aruLi – Instead of helping me just because I asked, you should do this as your goal. In bhagavath vishayam (spiritual matters), AchAryas does not help in expectation of something in return; it is purely out of their compassion; When they help us attain bhagavan who is the owner of both spiritual/material worlds, the sishya has nothing to offer in return which will match that. parAnkusa nAyaki glorifies the cranes greatly. Seeing that, the cranes ask “He left you like this. Is he going to listen to us? Also, when we go there (parampadham), everyone will look similar as stated in muNdaka upanishath 3.1.3 “niranjana: paramam sAmyamupaithi” (becoming pure, attains same qualities as bhagavan). How to distinguish bhagavan from nithyasUris and mukthas?”. vem chiRaip puL uyarththArkku – one who has the garuda dhvaja (flag) – this is the distinguishing aspect between bhagavan and others. Here garuda’s wings are having adjective of “cruel” for two reasons – a) he is capable of eliminating our enemies and help us reach there; b) he is the one who helped emperumAn leave us by carrying him – so he himself is described as cruel – just like AkrUra was accused as cruel by the gOpis due to him taking krishNa away from them. en vidu thUthAy – it is actually his duty to send some one to me to protect me, but now I have to send a messenger to him. You are going on my request – I am not so strong/able like pANdavas who sent krishNa as a messenger. I am such a helpless girl. Going as a messenger for others benefit is a rare opportunity. chenRakkAl – You are going to see emperumAn before me. Is that not great? van chiRaiyil – bhagavan will not imprison a messenger from parAnkusa nAyaki. But ignoring the messenger itself is considered as imprisonment. Like princes need to be pampered regularly – if they are not given betel leaves on time, they will become upset. en vidu thUthAy chenRakkAl van chiRaiyil avan vaikkil – When some one goes as a messenger of emperumAn, he may be imprisoned, tortured (by setting fire on the tail, etc) – like hanumAn went through. When you go as my messenger, he will embrace you as explained in srI rAmAyaNam yudhdha kANdam 1.13 “parishvangO hanUmatha:” (that hanumAn was embraced by me – on carrying the return message from sIthA pirAtti to srI rAma). You will be embraced by the chest I would like to embrace. avan vaikkil – would he imprison you? As explained in srI rAmAyaNam ayOdhyA kANdam 2.42 “vyasanEshu manushyANAm” (He feels the pain of the suffering of lowest of humans), he would never trouble you. In fact, he will hold your feet on his head. vaippuNdAl en cheyyumO – Even if he imprisons you, is it not something noble? Like sIthA pirAtti who herself allowed to be imprisoned by rAvaNa to release the dhEva sthrIs (celestial women) from the prison of rAvaNa – this will be greatly glorified as a noble gesture. This entry was posted in thiruvAimozhi, thiruvAimozhi 1st centum on July 12, 2015 by Sarathy Thothathri.